LP Police Announces New Search Capabilities for Voter Registration, People at Work and Social Media Profiles That Feature the Most Up-to-Date Information Available. Law enforcement and Government agencies can now locate affiliations, people, relatives, neighbors, businesses, associates and common residency instantly with the most reliable data feeds and easy to use investigative software tools. Complex cases are now solved with easy access to current phone data and fresh investigative data in real time. “The LP Police team is pleased to introduce yet another round of significant search updates and user improvements. Police departments and law enforcement agencies across the country unanimously endorse our data and customer support. 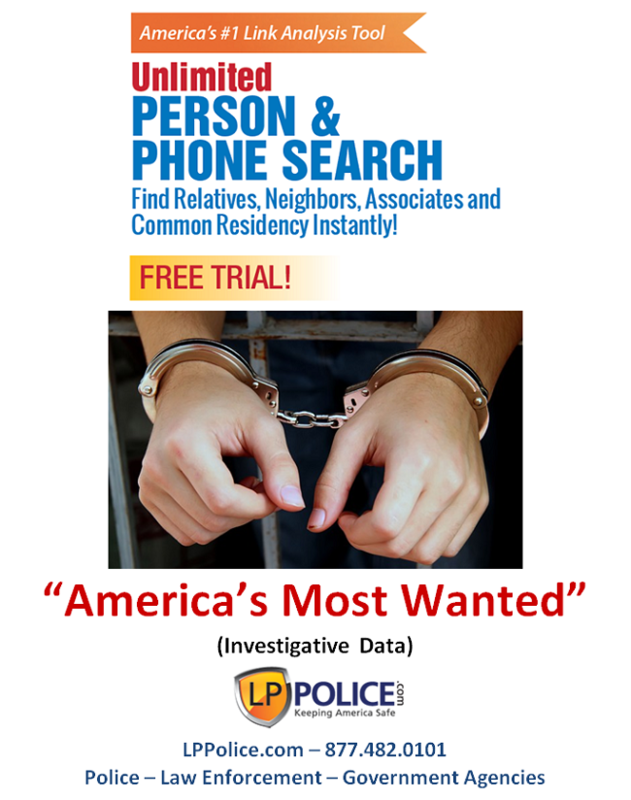 LP Police, America's #1 Person and Cell Phone Search Database for Government & Law, is proud to introduce the latest voter registration, people at work and social media searches that can now solve cases faster than ever before. The Social Media search can access profiles, profile photos, basic demographics, social influence and more from over 100 different social sites. Complimentary VIP training and customer support are always included to guarantee a successful and productive user experience. Unlimited Person, Phone, Property, Criminal, Civil and Business search includes a Cancel Anytime/Money Back Guarantee. Unlimited and Premium reports include full SSNs, DOBs, MVR, people, assets, licenses, court records (criminal/civil), phones, weapons permits, hunting/fishing licenses, watercraft records, FAA certificates, prior residences, real estate holdings, recorded bankruptcies, liens, judgments, businesses and more in a secure, interactive, searchable database. 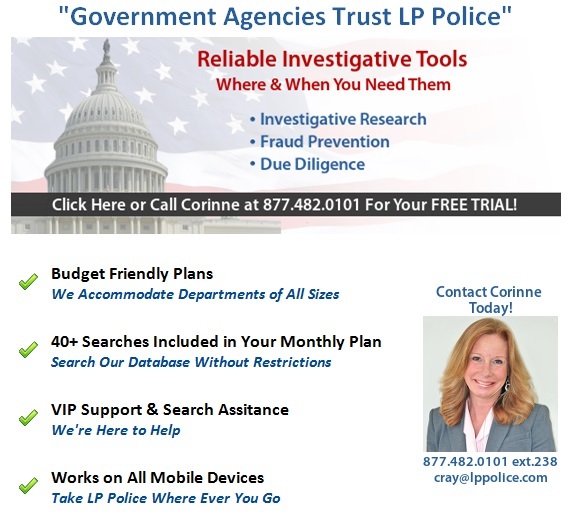 Law enforcement and government agencies (federal, state and local) are encouraged to experience the superior data, accuracy, world class free “VIP” technical support, one-on-one training, and customer service from LP Police. 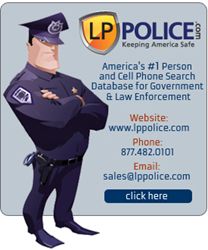 LP Police, located in Boston, Massachusetts is the nation’s leading provider of accurate, complete and cost-efficient investigative information and reports on a majority of the U.S. adult population. Our proprietary online skip tracing database can be used wherever there is an Internet connection, whether in an office or on a mobile smartphone or tablet device. Call Corinne at 877-482-0101 Ext.238 and sign up for a free trial. Background101.com FCRA certified employment background screening is available to qualified applicants. Background101 has been a leading provider of background screening information for more than 15 years. Please call 866-744-6438 for more information or contact sales(at)background101(dot)com. LP Police "Catch the Bad Guys"
"America's Most Wanted"LP Police "Solve More Cases"